After 26 hours on the train, I arrived in Grand Junction more than ready to move about the stunning landscape and drink Colorado wine. I had been to Grand Junction for the first time a little over a year ago and fell completely in love with the area, so much so that I almost moved there and still think pretty seriously about doing so. I had hauled my bike along last summer and spent almost the entire month of July biking around the area and soaking up as much local culture as I could. But this time around, I left my bike at home and my focus was solely on wine. 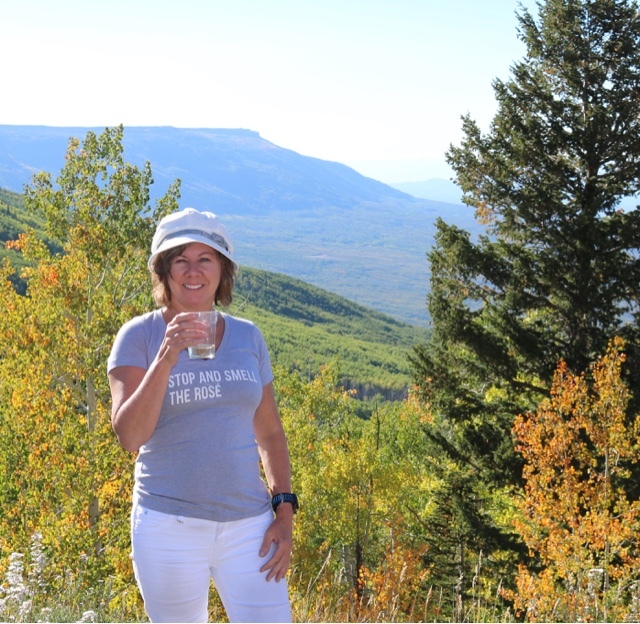 As a wine student, currently working on my WSET Level 3 Award in Wines certification, I went to the Colorado Mountain Winefest to learn. What makes Colorado wine Colorado wine, I wondered. I was eager to learn what varieties of grapes are grown, what the soil is like, what winemaking methods/techniques are used, and, most importantly, what the stories are behind the wineries. And, yeah, I wanted to drink wine as well. Essentially, when I found out there was a wine festival in one of my favorite places, I simply had to be there. In its 27th year, the Colorado Mountain Winefest now is a four-day event with plenty to offer. The festival itself was on Saturday, September 15, but from Thursday through Sunday, a full bill of peripheral events offered all sorts of wine-focused activities, most of which sold out well in advance: food and wine pairings, a bike tour, bus tours, a wine blending workshop, and a number of other events. I was able to get in on the Grand Mesa Wine Country Bus Tour and the Wine Blending Workshop. On Friday, fifty of us wine lovers left Palisade in a motor coach at 9 a.m. to tour and taste at three wineries: Colterris Winery in Palisade, Alfred Eames Cellars in Paonia, and Williams Cellars in Cedaredge. As we made our way from winery to winery, we were presented with spectacular views of the Grand Valley. On the motor coach, I was lucky to be sitting next to a retired forestry employee who shared his vast knowledge of the diverse characteristics of the land and vegetation. This Midwestern gal brought up among flat grids of cornfields and soybeans was seriously in awe of the ever-changing scenery comprised of mountain peaks and riverbeds, desertscapes and farmscapes. The wine country motor coach tour also treated us to a drive over the Grand Mesa National Forest, the largest flat-topped mountain in the world. The panoramic view of immense natural beauty at 11,332 feet above sea level was breathtaking. At the main event on Saturday, the winefest itself, 7,000 people gathered to sample wine from over 55 Colorado wineries. This was one big outdoor wine party with people of all ages spending their day connecting with each other while tasting wine, stomping grapes, feasting on food, listening to live music. Some took their winefest quite seriously by donning matching shirts and hats with their group of friends and family. It was particularly heartening to me to see so many young people (in their 20s/30s) not just drinking wine but being truly interested in wine. I myself went straight to the seminar tent to hear about the hardy hybrid vines of Colorado and participate in a showdown between Colorado versus California wines. Yeah, I am that person taking notes at a wine festival. Then I ate, sampled wine, ate again, listened to live music, and sampled more wine. Whew! When you combine a 95-degree day, with 4,700 feet of altitude, and so many samples of wine that you have no idea how much you actually drank, you hit a point where you feel it all pretty intensely. When I was done, I was done. It was nice, though, to have the opportunity to continue the wine fun into Sunday with the wine blending workshop over at Western Colorado Community College. Hosted by Jenne Baldwin-Eaton, the instructor of viticulture and enology at WCCC, the workshop covered a lot of fascinating material, such as reasons for blending, ways to blend, when to blend. The real fun, however, was in getting the opportunity to create our own blend. If I do say so myself, my partner, Amber from Salt Lake City, and I came up with a damn good blend. We were pretty impressed with ourselves. Wines, beakers, and blends, oh my! The whole winefest, the entire four-days of all things Colorado wine, was a great deal of fun, and I hope to make it back next year. Tickets for the 2019 Colorado Mountain Winefest go on sale November 26. If you are thinking about going, mark that date on your calendar and do not hesitate to buy tickets. All events related to the winefest sell out quickly.